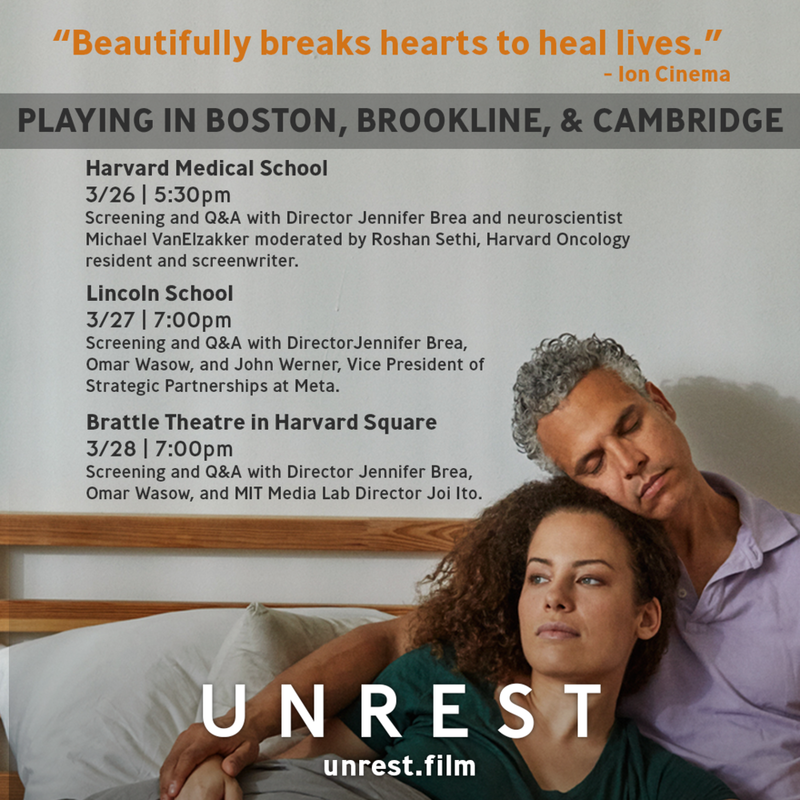 You’re invited to upcoming screenings of the Sundance award-winning, Oscar shortlisted documentary film, Unrest, at Harvard Medical School, the Massachusetts Department of Public Health the Lincoln School in Brookline, and the Brattle Theatre in Harvard Square. Harvard Medical School | Unrest screening and panel discussion with Director Jennifer Brea, Harvard neuroscientist Michael VanElzakker, Research Fellow, Massachusetts General Hospital, and Dr. Rachel Haft, Chief of the Division of Internal Medicine at Mount Auburn Hospital, moderated by Roshan Sethi, Harvard Oncology resident and screenwriter. RSVP: This event is free to attend. Harvard students, staff, faculty and local healthcare professionals are especially encouraged to attend. All guests must register and present ID. Please learn more and RSVP here. Massachusetts Department of Public Health | Unrest screening and panel discussion with Director Jennifer Brea, Dr. Ron Davis, Director of Stanford Genome Technology Center, moderated by NPR/WBUR Host Deborah Becker. RSVP: This event is now full. However, if you are a researcher/scientist, healthcare provider or public health professional, please still register, as we will do our best to accomodate you: Pre-registration required. Lincoln School | Unrest screening and panel discussion with Director Jennifer Brea, Omar Wasow and John Werner, Vice President of Strategic Partnerships at Meta. RSVP: This event is free to attend. Please learn more and RSVP here. Brattle Theatre | Unrest screening and panel discussion with Director Jennifer Brea, Omar Wasow and MIT Media Lab Director Joi Ito. RSVP: This event is free to attend. Open to the public – Harvard students, staff, faculty and local healthcare professionals are especially encouraged to attend. Please learn more and RSVP here. In this story of love and loss, newlyweds Jennifer and Omar search for answers as they face unexpected obstacles with great heart. Often confined by her illness to the private space of her bed, Jennifer connects with others around the globe. Like a modern-day Odysseus, she travels by Skype into a forgotten community, crafting intimate portraits of four other families suffering similarly. Jennifer Brea's wonderfully honest and humane portrayal asks us to rethink the stigma around an illness that affects millions. Unrest is a vulnerable and eloquent personal documentary that is sure to hit closer to home than many could imagine.